He keeps them in the car, and frequently finds them scattered all over the place. 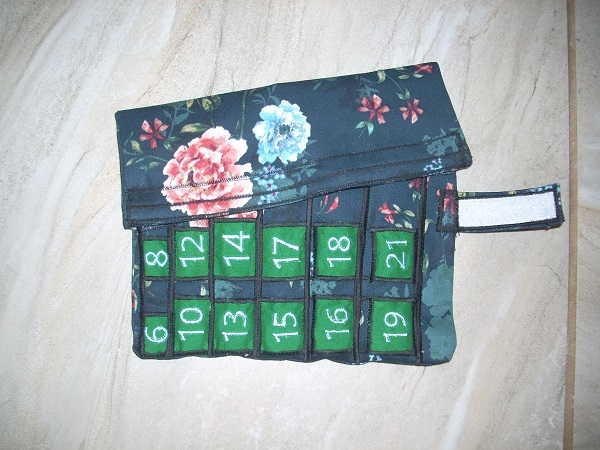 compact, easy to identify correct size, easy to get and put away, secure closure, beautiful. 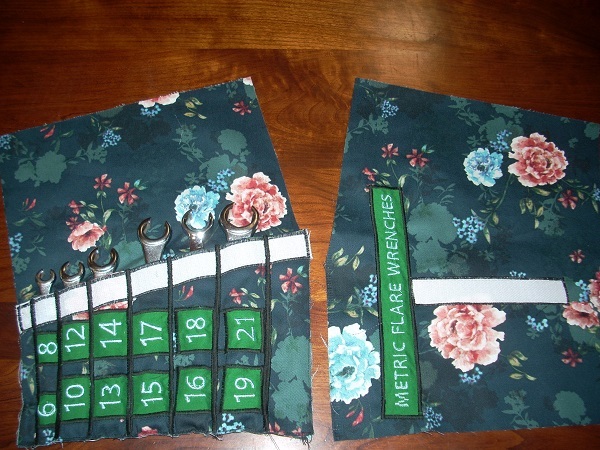 I'm making him four holders: SAE flare, SAE combination, metric flare, metric combination. 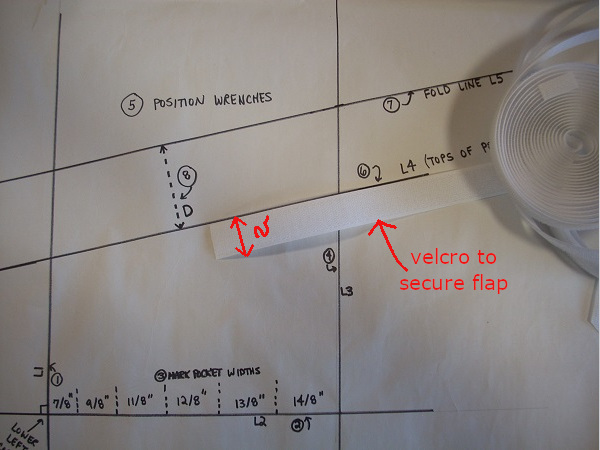 Sew right-sides together, for better visibility of markings. 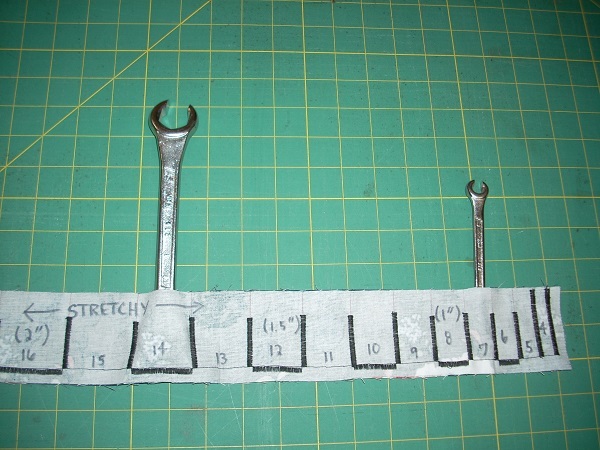 Make a test strip to determine the correct width for each wrench pocket. Pocket too big? Wrench falls out easily. Pocket too small? Frustrating/annoying to use. 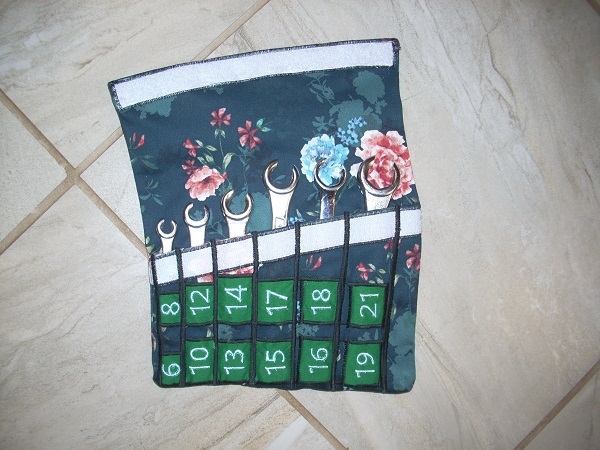 Use the same fabric as the organizer. 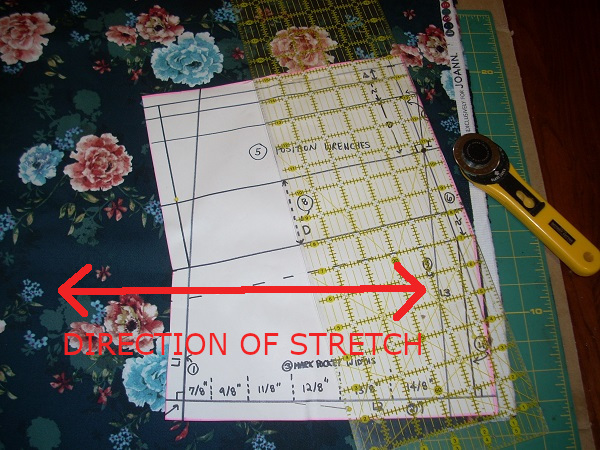 If the fabric is stretchy, put the stretchiest direction in the direction the organizer will be rolled. Sew strips right-sides together, so markings are easier to see. 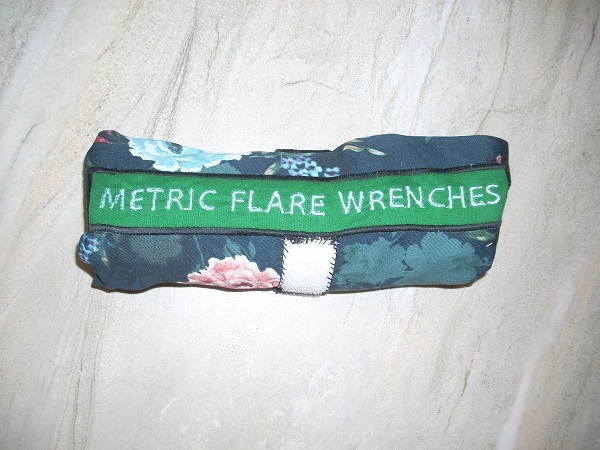 This should cover all normal wrench sizes. 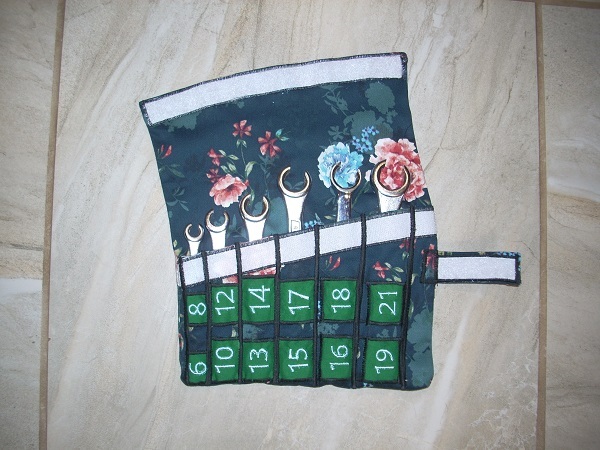 Use the same width zigzag to be used on your organizer; center the zigzag along each mark. 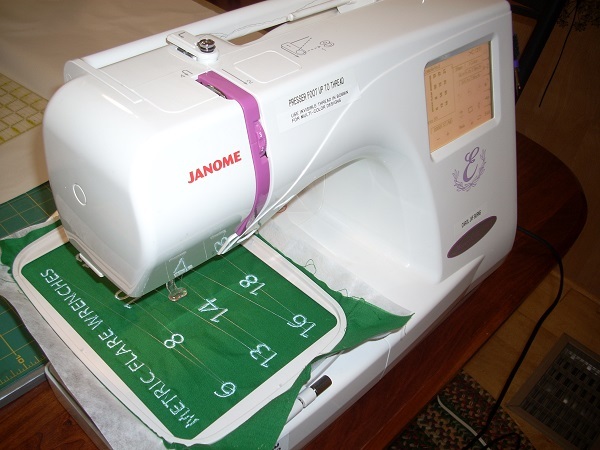 On my Janome 9400 QCP, I use width 4.0 (and density 0.4). 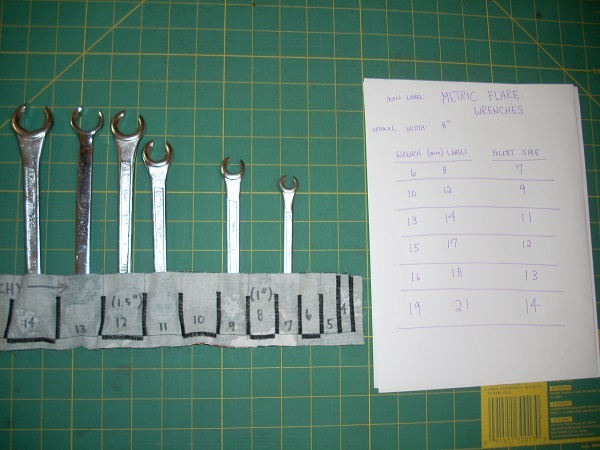 Use your test strip to determine the proper widths for each wrench. To maximize compactness, put the smallest side down (into the pocket). 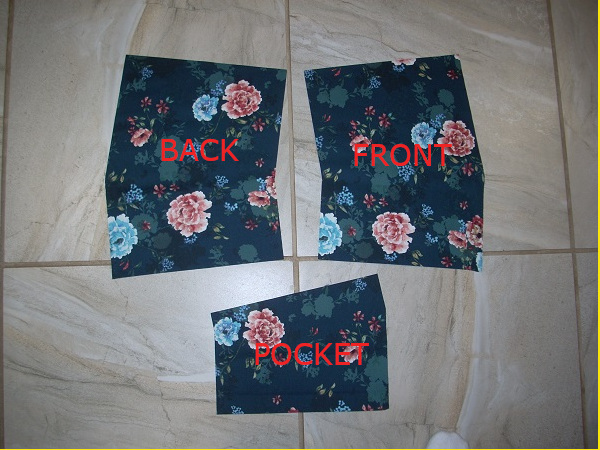 Can't decide between two adjacent pocket sizes? Err on the big side: you can always put in an extra line of stitching to tighten up a pocket, but you can't easily make it bigger! 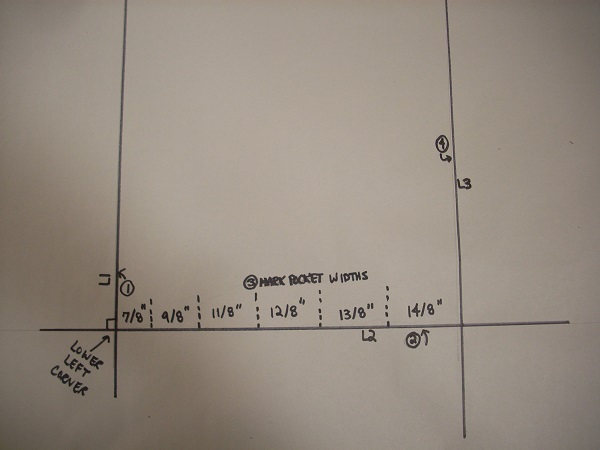 Record your work on a piece of paper (as shown). 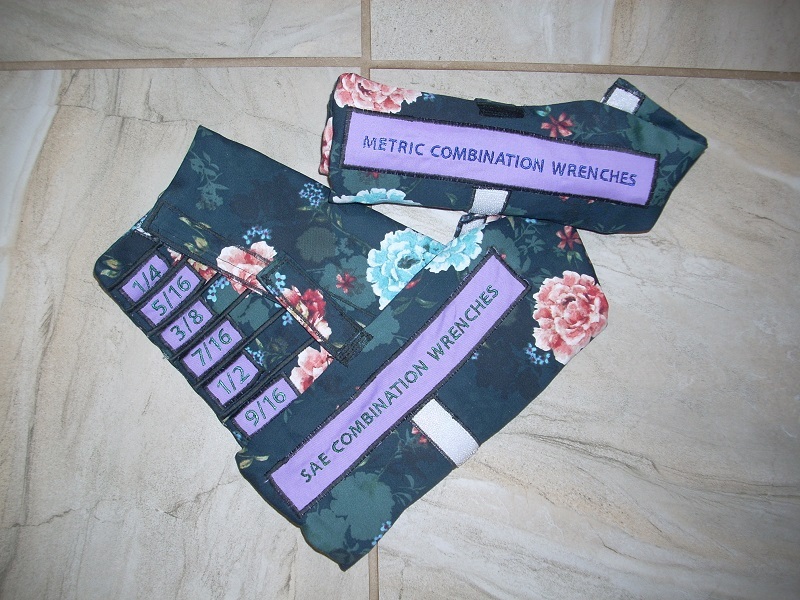 Sew all the labels at once. Clip threads on right side. Clip jump threads on back side. 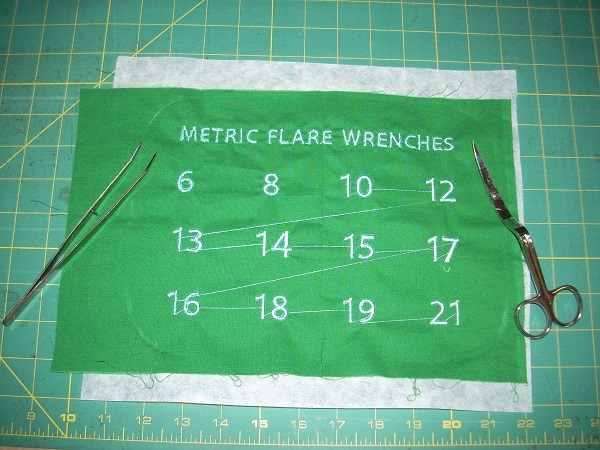 These take a while to stitch out, so get them going while you're cutting the fabric. They'll be cut and zigzagged onto the fabric. 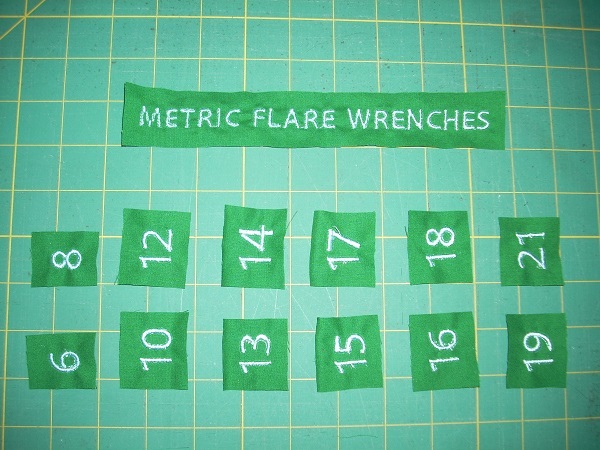 Make the main label (like METRIC FLARE WRENCHES) the width of the longest wrench, if possible. For uniformity, I make all pocket labels the same size (determined by the width of the smallest pocket). I use the ALIGN and DISTRIBUTE features of Embrilliance Essentials to evenly space the labels. This makes it easier to cut them apart after stitching. For best stitch quality, use the same color thread in top and bobbin. After sewing, clip threads on right side. Bent-handled embroidery scissors and sewing machine tweezers help tremendously! Clip only long jump threads on back side. 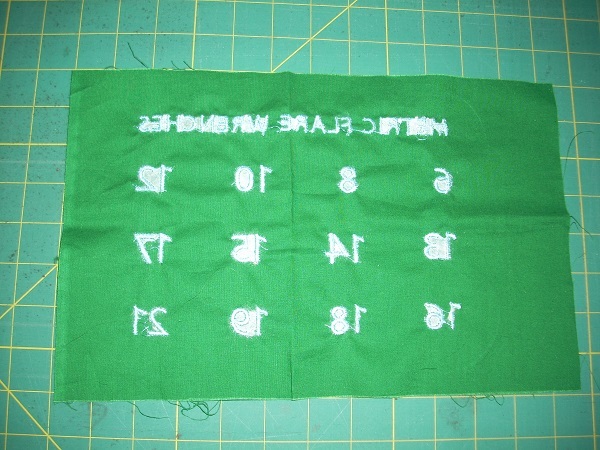 It is not necessary to get the tiny pieces of stabilizer from inside letters/numbers. Cut labels apart, leaving enough space around each to zigzag onto organizer. I use a piece of packing paper for the pattern. 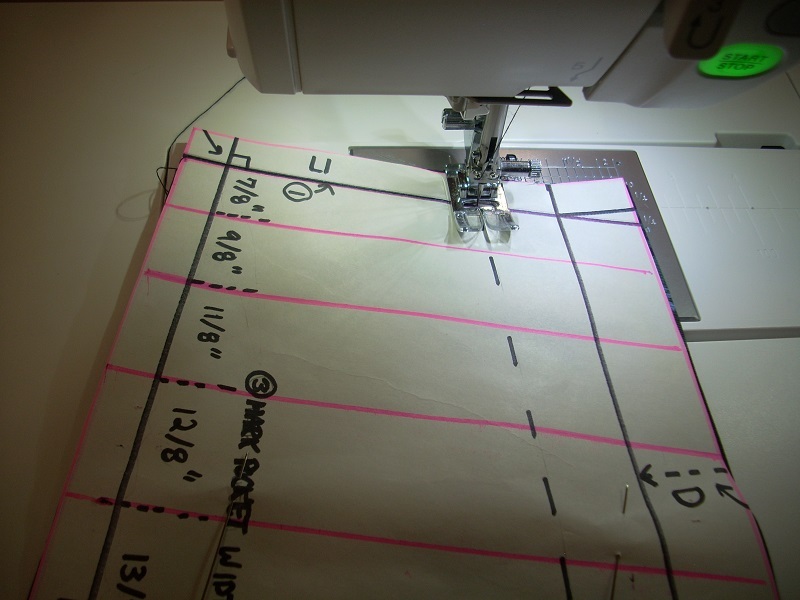 I use my Omnigrid quilting ruler for easy straight lines, perpendicular lines, measurements. For example, $\,D = 2.5\,$ means that $\,D\,$ is 2.5 inches. Draw a line for left edge of organizer (call it L1). The pattern will extend several inches to the left of this lineleave enough room! 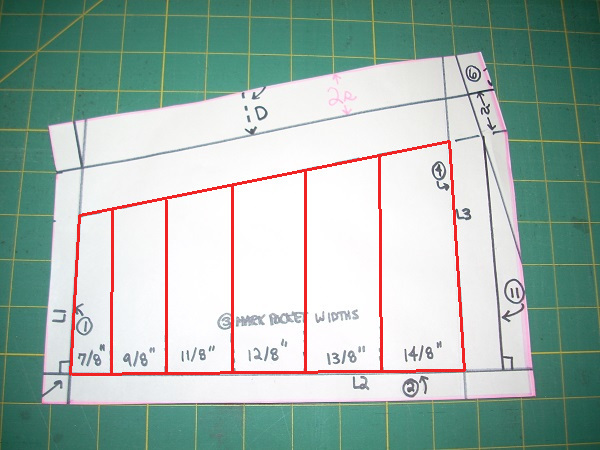 Draw a perpendicular line for bottom of organizer (call it L2). 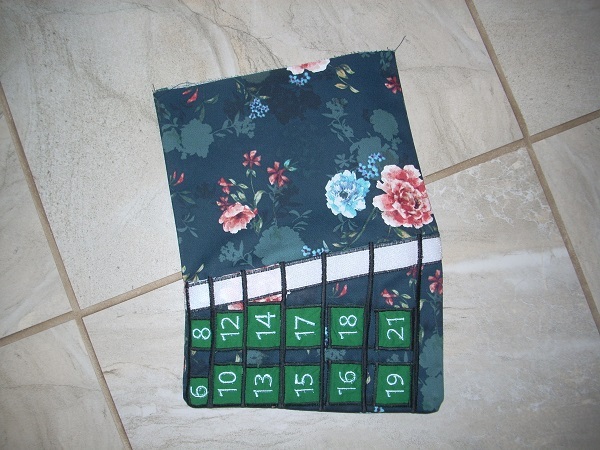 The point where L1 and L2 cross is the lower left corner of your organizer. Starting at the lower left corner, mark each pocket width (from your chart), from smallest to largest. Draw a line perpendicular to L2, at the right side of the last pocket. Call it L3. 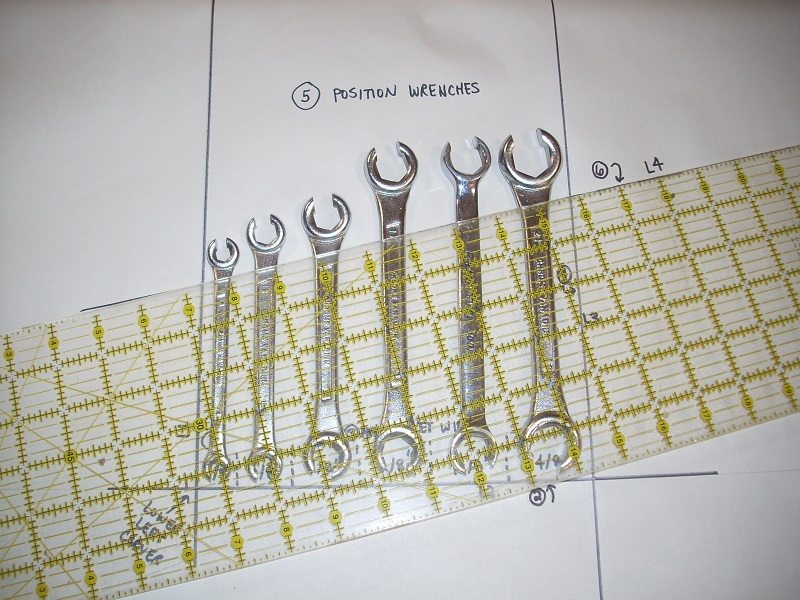 Lay your wrenches in place, centered in each pocket, with bottoms even and near L2. 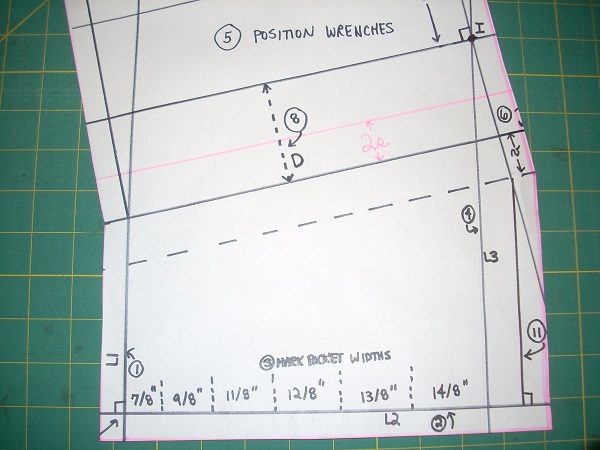 Draw a (slanted) line where you want the tops of the pockets (call it L4). You're actually just drawing parts of L4 that extend outside the wrenchesyou'll draw the center after removing the wrenches. 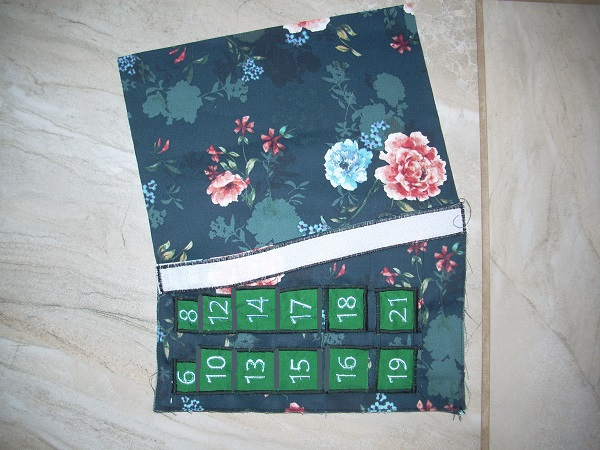 The pocket closure flap fold line is parallel to L4. it should be very close, without touching any wrench. To check the parallel condition, make sure the red measurements shown are equal. Draw the fold line (call it L5). Then, remove the wrenches and complete line L4. 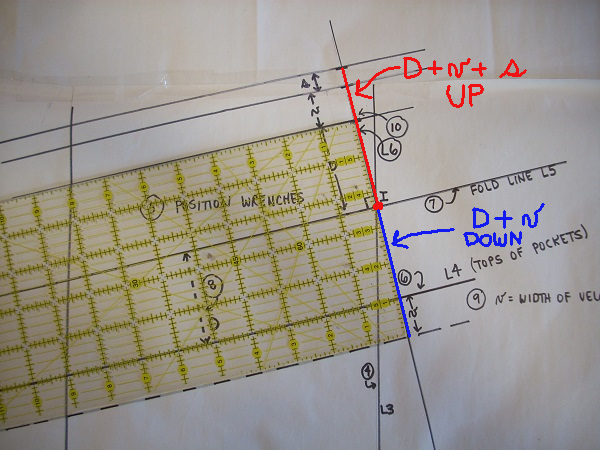 Measure the perpendicular distance between L5 (fold line) and L4 (top-of-pocket line); call it $\,D\,$. Let $\,v\,$ be the width of the velcro to secure the flap. Let $\,s\,$ be the desired seam allowance. Let $\,I\,$ (the red dot) denote the intersection of L3 and L5 (fold line). Draw a line through $\,I\,$ perpendicular to L5; call it L6. L6 marks the right (finished) edge of the closure flap. 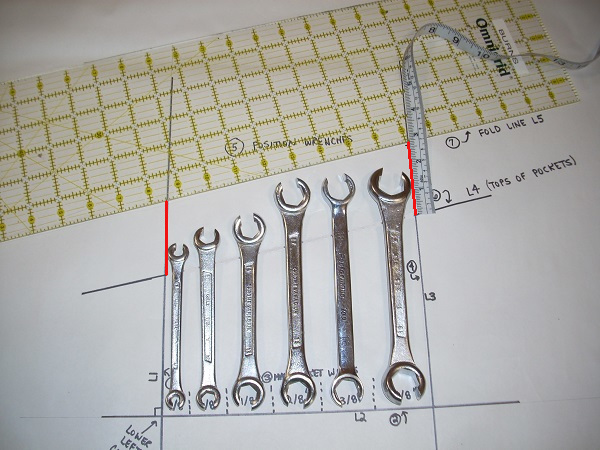 It marks the right edge of the wrench holder, from bottom of velcro to bottom of holder. 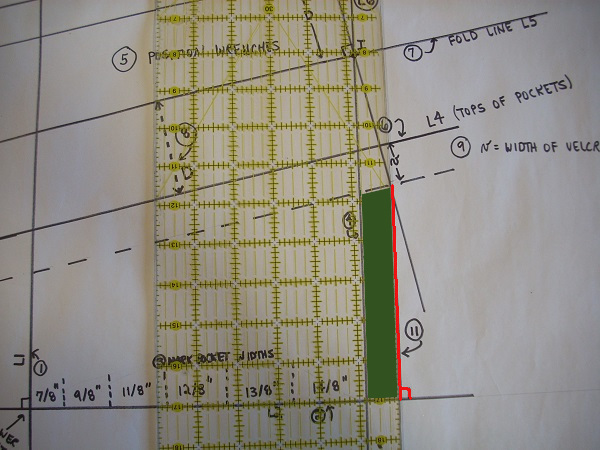 Note that there is some extra fabric (shown in green, between L3 and the red segment) that lies to the right of the biggest pocket. 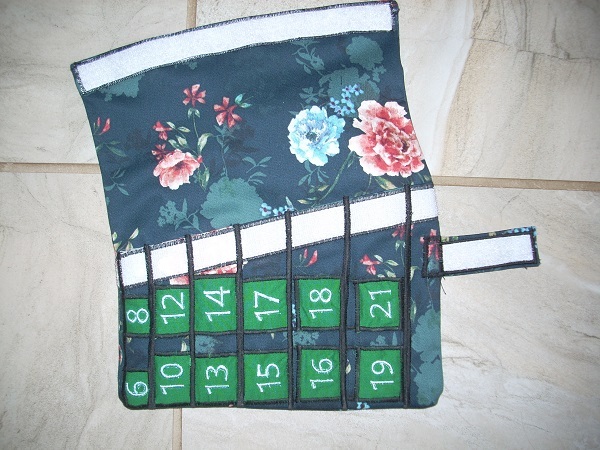 This prevents the flap from poking out when it's folded down. Draw the red segment, from L4 (top-of-pocket) to top of holder. 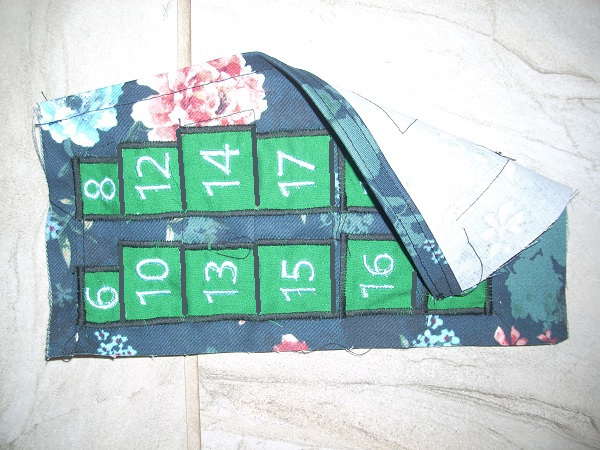 When the flap is folded down, there will be a tiny triangle (shown in green) where the bottom fabric shows through. Don't worry about this! It's not worth the effort to adjust for it. 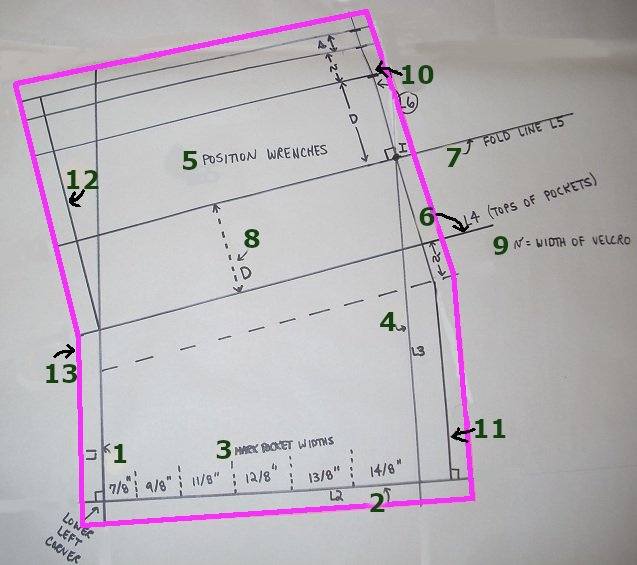 Draw a distance $\,s\,$ around the entire perimeter (shown in pink). This is your fabric cut line! The entire pattern is shown here, with some extraneous markings removed (for simplicity). you'll fold over $\,s\,$, and then $\,s\,$ again. Follow steps 13 at right. 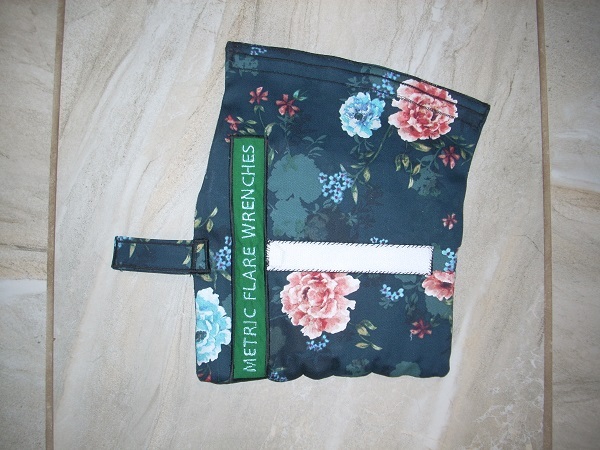 Label the pieces on the backs as shown below; this may prevent future errors! 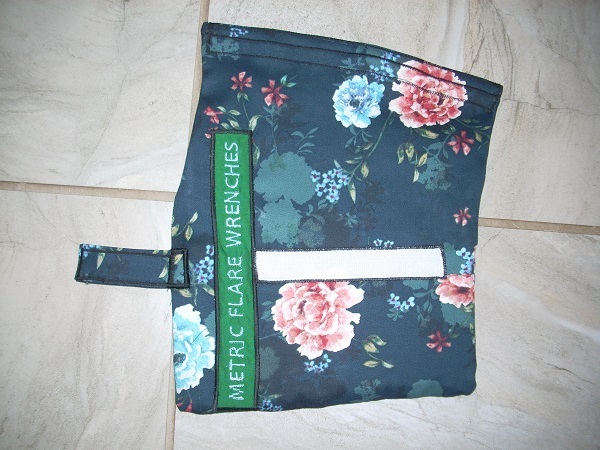 For all labels, straight-stitch first to check position. 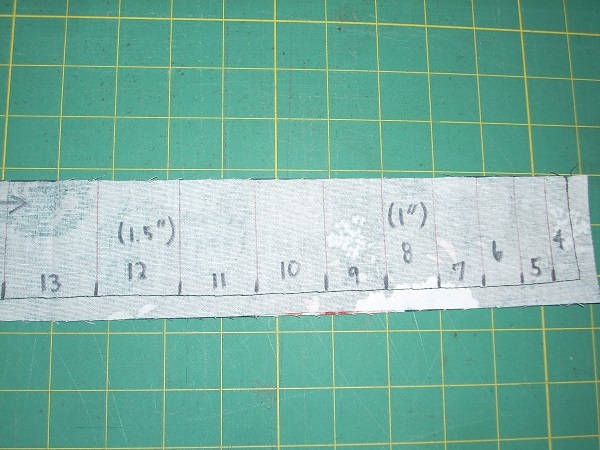 Or, use this fabric glue stick to secure the labels before zigzagging. Then, zigzag with a wide, dense stitch. 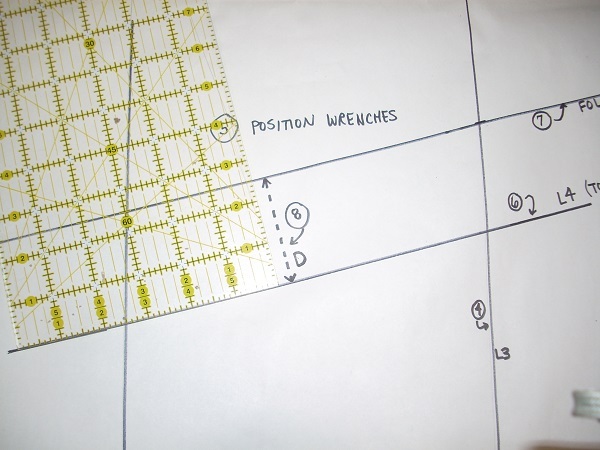 If you want to preserve your main pattern, make a photocopy to use for these steps! 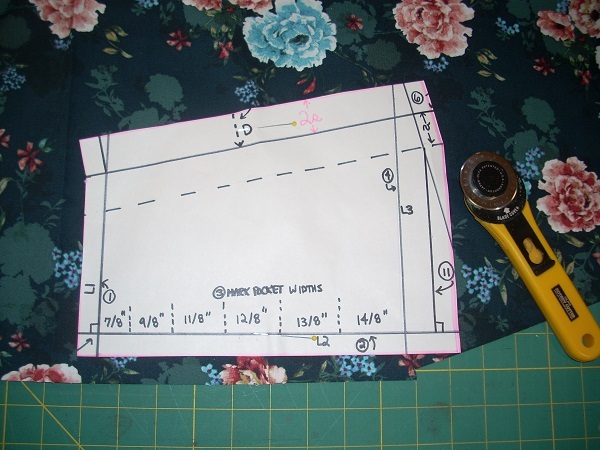 On your pattern, draw the vertical pocket separators (shown in pink in A). 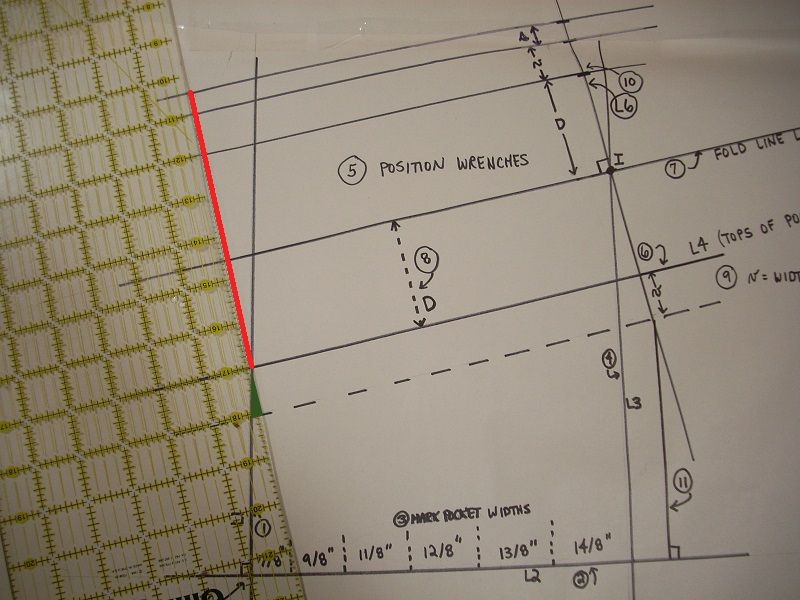 Place the pattern on the pocket fabric and stitch (through both paper and fabric) along the red lines shown in (B). These stitches will be covered in later stepsthey're only used for positioning. Remove and discard the paper. 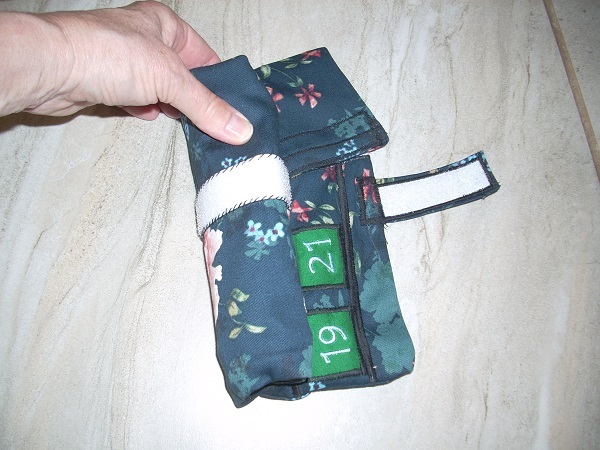 Make sure the pocket labels do NOT overlap the velcro! 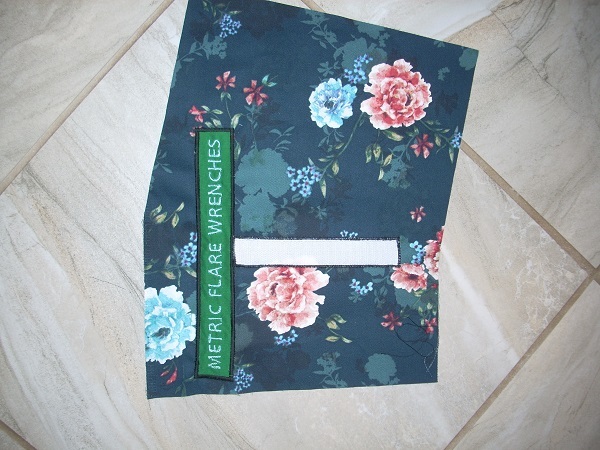 Sew on ALL sides of labels, even those that will be covered by future pocket separating stitches. Then, I zigzag with width 3.0 and density 0.5 (on the Janome 9400 QCP). Sew a piece of velcro (hard side) on back, as shown. This velcro is used to hold the organizer together when rolled. these stitches will be covered by velcro in the next step. Attach velcro (hard side) to the pocket top finished edge. stitching very close to the edge. zigzag the vertical pocket separator lines. 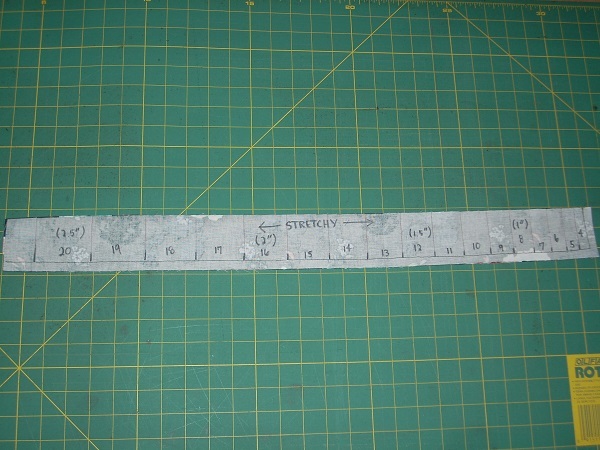 Be sure to use the same stitch width as used on your test pocket. Stitch from bottom to top, sewing over the velcro. Re-stitch, as needed, to get good coverage. 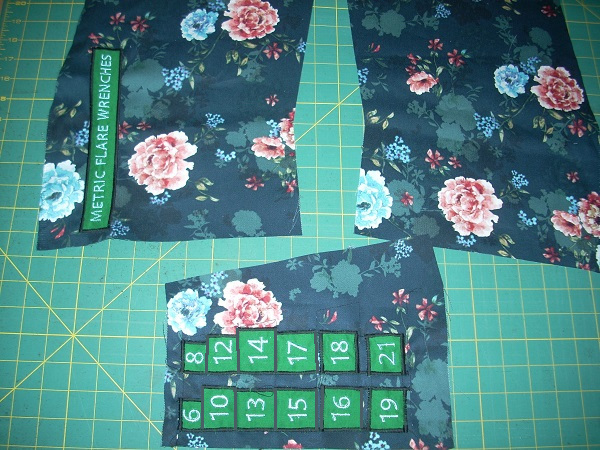 If too loose, add another row of zigzagging on one or both sides to tighten up the fit. 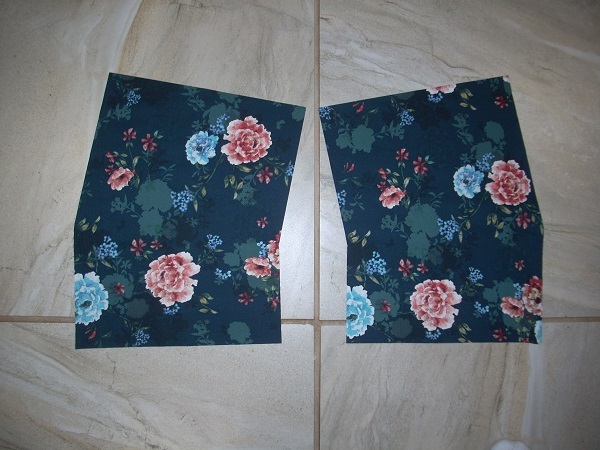 Sew right sides together along bottom and side edges (NOT the top). Use a slightly shorter straight stitch for extra strength (density 1.8). Slightly round out the angles; pivot at corners. Stitch again, close to the first stitching, for strength. 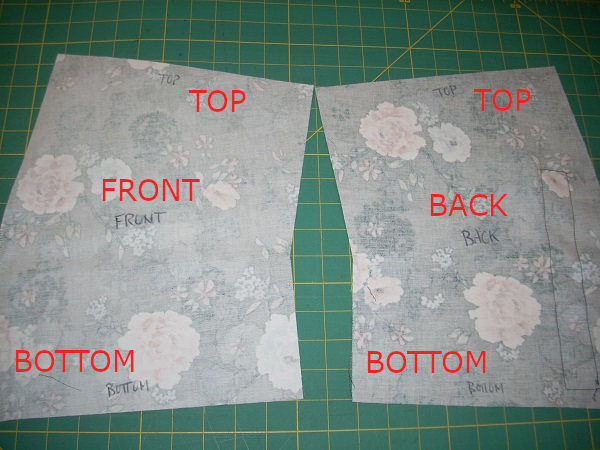 Turn $\,s\,$ to the inside (on both separate top sections) on top edge and stitch, to hide raw edge. Stitch again, through both layers, to close the top. 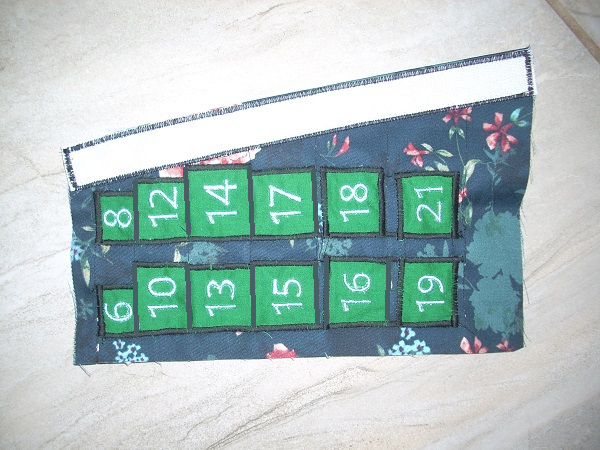 Attach velcro to top front (soft side), as shown. Cut a 4" by 3" rectangle of fabric. Press down &frac38;" on opposite long edges. Then, press down &frac38;" on the remaining opposite edges. Fold (along the long side) in half, right sides out, and press. this encloses all raw edges. leave about &frac38;" exposed at one end to attach to organizer. with velcro facing towards front. Make sure it lines up with the strip of velcro on back.